As new channels with advanced features become ever more popular, SMS needs a way to keep up as well and still provide content that is both informative and visually appealing. So, what about emojis within SMS using an A2P messaging (or SMS API) platform? Is it possible? Businesses aren’t restricted to pure text within SMS messaging platforms. They can communicate with their customers using modern hieroglyphics (aka “emojis) if they’d like and thus give the content a much-needed visual boost making them more appealing. That looks a lot better and appeals to younger generations. Especially useful if you’re a company that really knows its demographic and has a wide appeal among younger people. What’s the long answer though, what are the cons? Well, it’s not as easy as sending a plain-text SMS. Most importantly, using an emoji in an SMS message reduces the character length limit to 70 characters (from 160,) which can damper the SMS budget if you actually need the 160 characters to convey a single message. This means that the message containing the emoji up top is still 57 characters long, but the message maximum length tops out at 70 characters. So just by adding “see you soon” you’ve gone over the limit and are sending a multipart message that costs twice as much. If you need more characters and would still like to use emojis, you can, but you’ll need to send it in multiple parts. Multipart SMS messages can be tricky, though. Most smartphones and network carriers can handle multipart SMS messages and will wait for all of them to arrive, putting them in order, before displaying the message to the user. Yet we’ve had cases with Sprint in the United States where multipart messages can arrive out of order – which is due to Sprint not supporting concatenated SMS. These types of restrictions set by the operators need to be taken into consideration before setting up the notification or campaign as the invoice can grow big quickly. Does the phone support emojis? The next hurdle revolves around smartphone penetration in the markets in which you communicate via SMS. If the handsets don’t support emojis, they won’t get them. The recipient will be left wondering what you’re trying to say in that weird concoction of text-like symbols. While smartphones are becoming more and more available, there are still a fair amount of people in the world who use feature phones so knowing your demographic is key. Finally, SMS uses text-based standards (UCS-2 and GSM 03.38) and an emoji is considered a character. Yet you need to get that character into the message somehow. The simplest way to do it is to copy and paste the emoji into the message (whether in a service providers dashboard or through API calls). Also, Macs have an emoji-board built into Safari, but if you’re on a PC, add an emoji keyboard extension to Chrome and you’re all set. Just make sure you test it first to see if the image is sent properly and go over the message with an SMS length calculator. 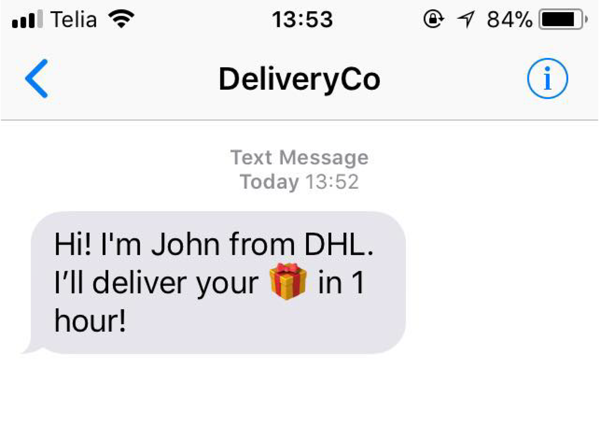 So, if you’re sending SMS notifications in a place like Sweden and you don’t need more than 70 characters in a message (or don’t mind the extra costs), emoji all you want – your customers might appreciate it and that’ll help build upon your existing customer relationship.